pt::pgen(n) 1.0.2 tcllib "Parser Tools"
::pt::pgen inputformat text resultformat ?options...? This package provides a command implementing a parser generator taking parsing expression grammars as input. 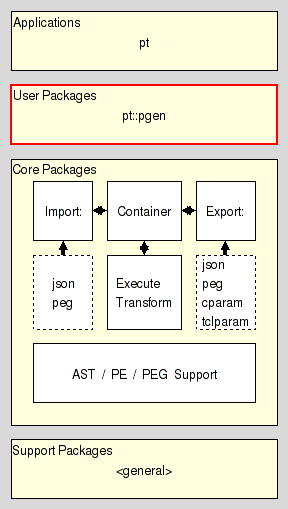 It is the implementation of method generate of pt, the Parser Tools Application. As such the intended audience of this document are people wishing to modify and/or extend this part of pt's functionality. Users of pt on the other hand are hereby refered to the applications' manpage, i.e. 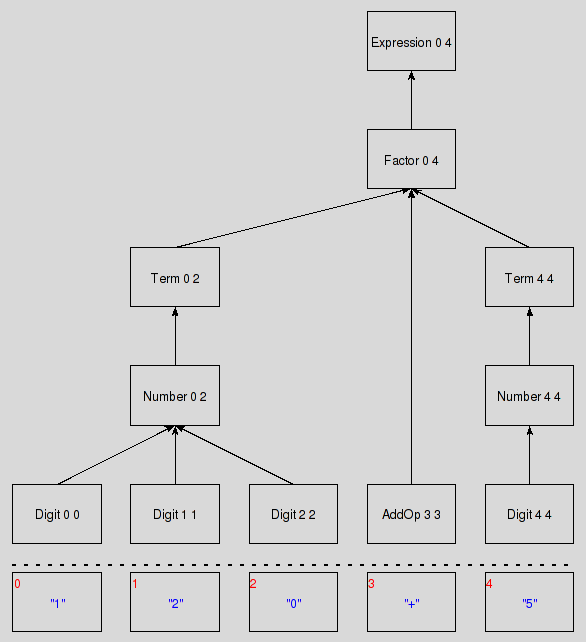 Parser Tools Application. It resides in the User Package Layer of Parser Tools. This command takes the parsing expression grammar in text (in the format specified by inputformat), and returns the same grammar in the format resultformat as the result of the command. The options supported by each of these formats are documented with their respective packages. From this we create a snit-based parser using the script "gen"
Regardless, at this point it is the user's responsibility to work with the tree to reach whatever goal she desires. I.e. analyze it, transform it, etc. The package pt::ast should be of help here, providing commands to walk such ASTs structures in various ways. One important thing to note is that the parsers used here return a data structure representing the structure of the input per the grammar underlying the parser. There are no callbacks during the parsing process, i.e. no parsing actions, as most other parsers will have. Going back to the last snippet of code, the execution of the parser for some input, note how the parser instance follows the specified Parser API.